Our bodies may be toxic waste sites. Today we take it for granted that there are unwanted substances in our bodies, coming from things we’ve eaten, from drugs our doctors prescribed, from smog, or perhaps from our drinking water. Yet we hope that poison is a matter of dose—that there is a threshold of safety, and that whatever we are carrying is below that threshold. We willingly ingest food preservatives, hormones, and antibiotics, trusting that the experts know what they are doing. After all, if scientists knew these substances to be harmful, governments would ban them. True, there are reasons to be skeptical: we do not always trust governments to make the right decisions, we rarely count on corporations to be ethical entities, and we wonder if scientists have the knowledge, the will, or the power to make a difference. But it is another thing entirely to imagine tossing out the whole notion of thresholds. If the dose doesn’t make the poison, what does? This question stands at the heart of Nancy Langston’s book, Toxic Bodies. 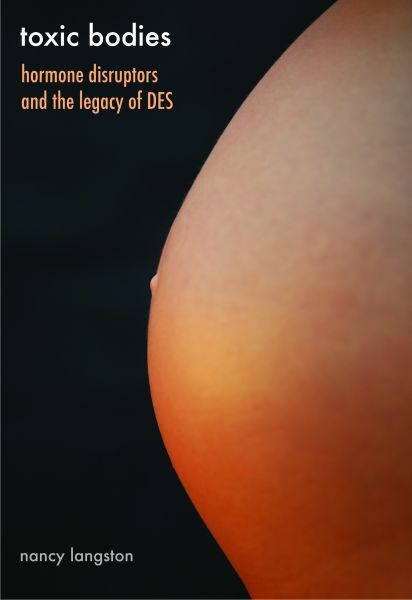 Langston tells us of the synthetic estrogen diethylstilbestrol (DES), a hormone disruptor that doctors prescribed to pregnant women for decades in the mid-twentieth century. Although scientists knew of its potential risks, they were apparently impotent in the face of industry to persuade the U.S. government to impose federal regulations until long after there were names for the victims: DES daughters and DES sons. By the end of the twentieth century, scientists linked the disruption of hormones by synthetic chemicals such as DES to an array of problems: reproductive health in wildlife, birth defects in humans, increases in prostate cancer, infertility, and sexual maturity at young ages. Because hormones regulate communication between cells and organs, disrupting them can have dire consequences in the development of animals and humans. In telling the story of DES, Langston takes issue with the prevailing idea of threshold doses of exposure. She links DES’s history to that of dichloro-diphenyl-trichloroethane (DDT) and to the chemical compounds found in many plastics today. These stories have commonalities, not simply in terms of corporate irresponsibility or scientific uncertainty, but in illustrating how the threshold view of environmental contamination continues to constrain our actions. Langston argues for a new ecology of health emphasizing that “the body is enmeshed in a web of relationships, not isolated within a castle whose threshold can only be breached by a sustained attack from the outside” (p. 147). Like Lytle, Frederick Rowe Davis has researched key figures in the history of conservation and environmental protection, but he also is an expert on the developing science of toxicology during the period discussed in Langston’s book. Davis’s first book was on the savior of sea turtles, Archie Carr. His latest project is on the relationship between pesticide use and the development of toxicology. It has won substantial financial support from the National Institutes of Health, and will soon appear as Pesticides and Toxicology: A Century of Risk and Benefit. While his first book was on the origins of conservation biology, the work on toxicology expands upon his 2001 Yale dissertation on risk assessment from 1936-1997. Thomas R. Dunlap has written numerous works in environmental history, often with a keen eye toward the history of science. In his 1981 study of DDT, he emphasized the ways in which citizens action groups, such as the Environmental Defense Fund, sought redress in courts and hearings rather than simply relying on publicity or education. Over the years Dunlap has demonstrated wide-ranging expertise in environmental ideas, exemplified by his books Nature and the English Diaspora and Faith in Nature. More recently he has returned to DDT with an edited collection of “classic texts” for the Weyerhaeuser series at University of Washington Press. Stephen Bocking is especially interested the development of scientific ideas, fully contextualized in social values and politics. In his 1997 book Ecologists and Environmental Politics, he criticized historical outlooks that presented scientists (in Bocking’s study, ecologists in particular) as either exemplifying or opposing dominant social values. Instead he proposed studying the diverse contexts in which they worked, fully embracing “the complexity of environmental politics and the historical contingency of the relationship between ecology and social values.” These contingencies, and the myriad problems of scientific authority, he discussed in a later book, Nature’s Experts. Before turning to the first set of comments, I would like to thank all the roundtable participants for their participation and for their patience. In addition, I would like to remind readers that as an open-access forum, H-Environment Roundtable Reviews is available to scholars and non-scholars alike, around the world, free of charge. Please circulate. This and other roundtables can be read in their entirety (for free) here. Mark Hamilton Lytle, The Gentle Subversive: Rachel Carson, Silent Spring, and the Rise of the Environmental Movement (New York: Oxford, 2007), p. 237. Frederick Rowe Davis, The Man Who Saved Sea Turtles: Archie Carr and the Origins of Conservation Biology (New York: Oxford, 2007). Frederick Rowe Davis, Pesticides and Toxicology: Episodes in the Evolution of Environmental Risk Assessment (1937-1997) (Ph.D. Dissertation, Yale University, 2001). Thomas R. Dunlap, DDT: Scientists, Citizens, and Public Policy (Princeton: Princeton University Press, 1981); Thomas R. Dunlap, Nature and the English Diaspora: Environment and History in the United States, Canada, Australia, and New Zealand (Cambridge: Cambridge University Press, 1999); Thomas R. Dunlap, Faith in Nature: Environmentalism as a Religious Quest (Seattle: University of Washington Press, 2004); Thomas R. Dunlap, DDT, Silent Spring, and the Rise of Environmentalism (Seattle: University of Washington Press, 2008). Stephen Bocking, Ecologists and Environmental Politics: A History of Contemporary Ecology (New Have: Yale, 1997). Quote on p. 203. See also Stephen Bocking, Nature’s Experts: Science, Politics, and the Environment (Piscataway, N. J.: Rutgers University Press, 2004).